They’re created in the long, boring hours on the bus traveling from one game to another. The bus has become a haven of sorts for teammates to come together and bond. It’s a place where players get to know each other while telling long-winded stories or challenging each other to card games and video games. It’s where they relax, read and catch up on some needed sleep before they arrive at the next arena. 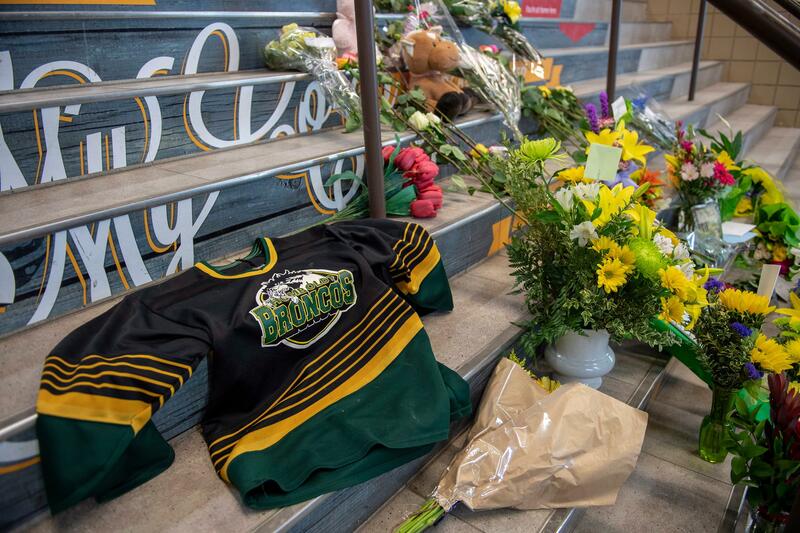 When the news broke about the Humboldt Broncos’ fatal bus crash on Friday that killed 15 people, it shocked the rural Humboldt community and the rest of the hockey world. The Saskatchewan Junior Hockey League team was on its way to play the Nipawin Hawks in a playoff game when the Broncos’ bus collided with a semi-trailer unit. Canadian police reported 14 others were injured and three were in critical condition. Spokane native Connor McIntosh, who plays in the same league as the Broncos, said such a horrible accident doesn’t cross anyone’s mind when they settle in their safe haven for a few hours on the road. The 19-year-old McIntosh, who graduated from Mead High, has done his fair share of road trips along Highway 35 where the Broncos’ bus crashed. It’s a two-lane, flat road in the prairies that seems to stretch on forever before hitting another small town. Besides hitting a deer or two on the highway or driving through an occasional snow storm, McIntosh said that Highway 35, or any other road through Saskatchewan, has never sparked his concern. “This is just something that happened and should have never happened,” he said. Long, tiresome trips on weather-worn highways and alongside semis are usually a given among sports teams, particularly those in the junior leagues who don’t often have the option to fly. The Spokane Chiefs of the Western Hockey League are no different than any other junior league team in the Northwest that has to travel the desolate highways to their next game. Throughout the winter months, they travel the roads through Saskatchewan, Alberta and British Columbia. They also hit Snoqualmie Pass even when covered in snow to get to arenas west of the Cascades. Concerns with road conditions and traveling times have popped up within the Chiefs organization. General manager Scott Carter said the Chiefs rely on the bus drivers at Northwest Stage Lines to get their players to each game safely and to determine if road conditions are too dangerous to travel. The Chiefs have delayed travel in the past because of weather and at times the bus drivers have opted to put on chains when roads get packed down with snow. But not much can be done about avoiding human error, which may have been the cause of Friday’s tragedy. “When you think of the amount of travel that we do, we’re very fortunate that these types of situations don’t occur more often, to be honest,” Lambert said. Lambert has first-hand experience of what a tragedy like this does to tight-knit towns like Humbodlt. He was playing for the Swift Current Broncos of the Western Hockey League in 1986 when four of his teammates were killed in a bus crash. While leaving Swift Current on Highway 1 for a game in Regina, the bus hit black ice and flipped into an embankment. Lambert was on loan to another team at the time and wasn’t on the bus. He returned home to a community in mourning following the accident that made Lambert and several of his teammates question their future in hockey. “We as a team tried to rally around the fact that we knew that the guys that passed away in the bus accident, that they would want us to continue and to push forward and push through,” Lambert said. “The last thing that they would want you to do was to quit or quit on your dream or your passion. “I think that’s important for them to realize or to understand,” he said of Friday’s survivors. The Chiefs had their own scare in 1997 when they were traveling through British Columbia. Their bus slid off Highway 3 and rolled about 40 feet into an embankment. Toronto Maple Leafs head coach Mike Babcock, who grew up in Saskatchewan, was the head coach of the Chiefs at the time. He was among 21 players and a handful of team staff on the bus that day. Fortunately, no one was killed. Yegor Mikhailov, who was 18, had the worst of the injuries with three scrapes to his forehead and one on his hand. “I always used to think about those vans that coaches would drive in college soccer and I always thought those were a nightmare, and this is supposed to be as safe as it gets,” Babcock said. Published: April 7, 2018, 8:01 p.m. Updated: April 7, 2018, 8:56 p.m.